The Replenishment launch for the Global Fund to Fight AIDS, Tuberculosis and Malaria (Global Fund) was a success -- in funding and more. By the end of the pledge meeting in Montreal estimated commitments came close to the $13 billion goal, and additional pledges may be announced in the future. Some countries, such as Norway, Japan and Canada, offered dramatic increases. Nine African countries stepped up to contribute, and Qatar made its first pledge to the Global Fund. During the pledging conference, numerous government representatives spoke of the increasing efficiency and impressive outcomes the Global Fund has demonstrated. The feeling in the room, spirited on by Bill Gates, Bono and Canadian Prime Minister Justin Trudeau, was that the Global Fund is a club that countries and major private donors want to be part of. The success of Replenishment is particularly welcome given the Kaiser Family Foundation (KFF) report this summer showing a decrease in donor financing of the global AIDS response. Dips in donor support for global health have turned around in the past and hopefully Replenishment signals they will again. But the Global Fund isn't about a program, it's about saving lives and ending the three biggest infectious disease killers in the world, diseases that together claim more than 2.5 million lives every year, over half a million of them children. The tragedy of those deaths, devastated families and destabilized communities simply isn't necessary and isn't tolerable. With scientific advances and increasingly strategic delivery of services, ending these epidemics could be the first great accomplishment of the 21st century. That is why the Montreal meeting needs to be a launching pad for global health financing sufficient to make these epidemics history. 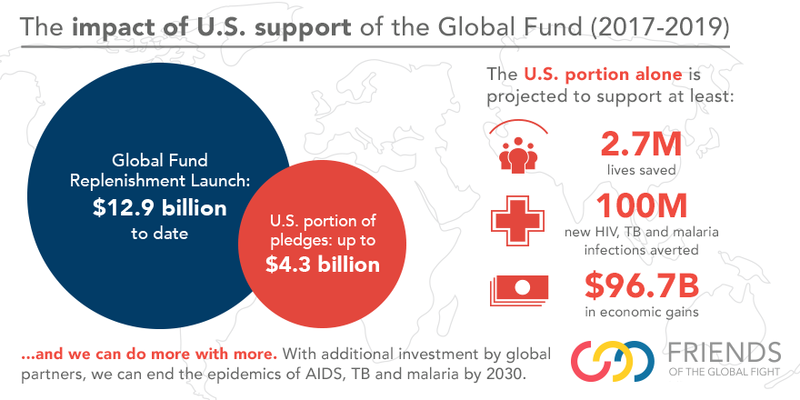 At Replenishment, the United States continued its impressive leadership on Global Fund support with a pledge of up to $4.3 billion through 2019, matching one dollar for every two dollars pledged by others. In delivering the U.S. pledge, Deputy Secretary of State Heather Higginbottom said, "We're not only committed to fighting these epidemics, we are committed to ending them by 2030." That must be the ultimate goal, but today that global effort is underfinanced. The $13 billion for the Global Fund, combined with hoped-for major increases in spending by implementing governments and sustained funding from donors, represents only 80 percent of what is required to end the AIDS, tuberculosis (TB) and malaria epidemics. We are in striking distance, but not yet on track. In his State of the Union address this year, President Obama said that ending the scourge of AIDS is "...within our grasp. And we have the chance to accomplish the same thing with malaria." We should be proud that the U.S. is the leader on Global Fund financing as well as other areas of global health. It's also true that in recent years the U.S. government budget for addressing AIDS, malaria and TB has been relatively flat. The new Administration and Congress, working with our partners globally, can make sure increased funding and strategic approaches are in place to realize the potential we have to end the epidemics. Implementing governments and other donor countries must do more. And part of that collective effort will be increased US investments in the Global Fund as well as our bilateral programs, including the President's Emergency Plan for AIDS Relief (PEPFAR), the President's Malaria Initiative (PMI) and USAID's TB program. Increasing global health funding will require that we do a better job of communicating with the American people about the enormous pay off of U.S. investments in this area: in lives saved, economic growth, political stability and diplomatic benefits for our country. A KFF poll from earlier this year found that fewer Americans than in years past report hearing about global health issues. Given that more people support increased funding for global health when they learn what a small percentage of the budget it represents, there is a real opportunity to communicate more widely and effectively with Americans about the benefits of these investments. Speaking at the Replenishment Conference, Global Fund Executive Director Mark Dybul noted that we are on the right side of the tipping point in tackling AIDS, TB and malaria. "But the thing about tipping points," Dybul said, "is that they can go either way." And he noted that infectious diseases, when neglected, can come back stronger, particularly given the potential for developing drug resistance. The end of the AIDS, TB and malaria epidemics is on the launching pad. Now the global community needs to seize the opportunity and commit the resources necessary to end these epidemics for good. Chris Collins is President of Friends of the Global Fight Against AIDS, Tuberculosis and Malaria. His email is ccollins@theglobalfight.org.